B B B Bear: Exploring Grand Teton & Arches National Parks — 2checkingout | travel and adventure | Inspiring. Capturing. Experiencing. Please tell me when we get to have a lay-in? Seems like every day we wake before dawn, looking for wildlife that’s still tucked up bed or peeking at the sun rising through a blanket of cloud. All for our lovely readers, hope you appreciate it. Today’s early departure is because we’re heading to Grand Teton, the next park on our list. Plus we wanted to try to secure a site at the RV park before the crowds rolled in. Our next destination was only 7 miles down the road. A close neighbour and a much smaller sibling to Yellowstone. The park is only 480 square miles in size compared to big brother up the road at 3,500 square miles. What it lacks in width it makes up for in height, offering some of the tallest peaks in the region. On the road in we stopped at a couple of lookouts to soak up the stunning views of the magnificent Tetons. If only we had known the view would be fleeting. Turns out we could have climbed out of bed at 4.00am and it wouldn’t have made a difference. The RV park was full for the week. Damn the sun chasing, time on their hands, grey brigade. How about backing off to your retirement village, taking your fancy rigs with you and letting the tourists have some space. Things happen for a reason though, and it turned out the nearby campground with not quite the same facilities but at half the price was more than happy to welcome us. And we would get an extra surprise later that evening. Grand Teton was planned to be a two day stop over as we headed south to a bunch of parks in Utah. We quickly made our way to the visitor centre at Colter Bay. Did we tell you that these are a must do first stop at each park? Behind the centre was a short hike around Colter Bay, a mixture of forest and shoreline. The walk offered a great perspective of the Tetons which looked even more majestic towering over Jackson Lake. Late afternoon we ventured out to Oxbow Bend to listen to a ranger talk on the local wildlife. Turned out to be more of a chance for visitors to share gossip and binoculars than an educational opportunity. We did see a gang of elk in the distant with a stag keeping sentry over his harlem of girls. The hot gossip was the death of a volunteer at Yellowstone that had been attacked by a female grizzly and her two cubs. They had partially eaten him and stashed parts of his body. This happened a few weeks before our visit. Slightly worrying. We returned to camp as dusk fell. After dismantling and stowing the bikes, I went to the bathroom block to spend a penny. Returning, I almost poo’ed my pants as I came face to face with a bear just a few feet from the van. Was this an aggressive grizzly bear or the more timid black bear? With this afternoon’s gory story still swimming around my head I wasn’t stopping to ask for identification. I threw open the RV door, stumble inside and stammered ‘bbbbbb bear!”. We watched from the safety of the cab at first. Then feeling ‘smarter than the average bear’ we ventured outside to see the black bear meander through the campground. Talk about close encounters. No we didn’t grab a photo, it happened quick and it was pretty dark already. The following morning as we left, we mentioned the encounter to the guy at the gate, he just said ‘yep that black bear comes through here all the time’. They somehow forgot to mention this when we checked in. The weather had taken a turn for the worse and our plans to catch the ferry across Jenny Lake and hike the Cascade Canyon went out the window. We mooched around a couple of lookouts trying hard to peer through the heavy blanket of clouds. 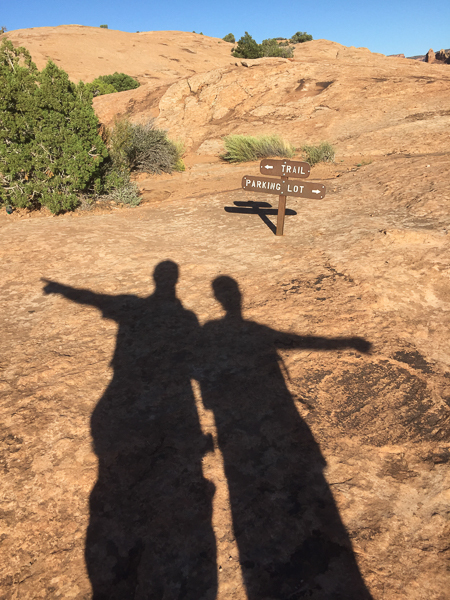 A decision was made to cut our losses and start the journey south to Arches National Park, nearly 500 miles away. We broke the journey by staying the night at Jordanelle State Park. Woken by the driving rain and howling wind. This was going to be a fun journey. Did we say that the RV wobbled like a wet cardboard box in the wind? We arrived on the outskirts of Moab, the nearest town to Arches, late afternoon. We checked the first RV park we came to for a space. We nearly choked when they wanted to charge US$53 per night. The girl at the desk scoffed when we said we would look elsewhere. Such great customer service! The next two parks displayed the ‘no vacancy’ sign. 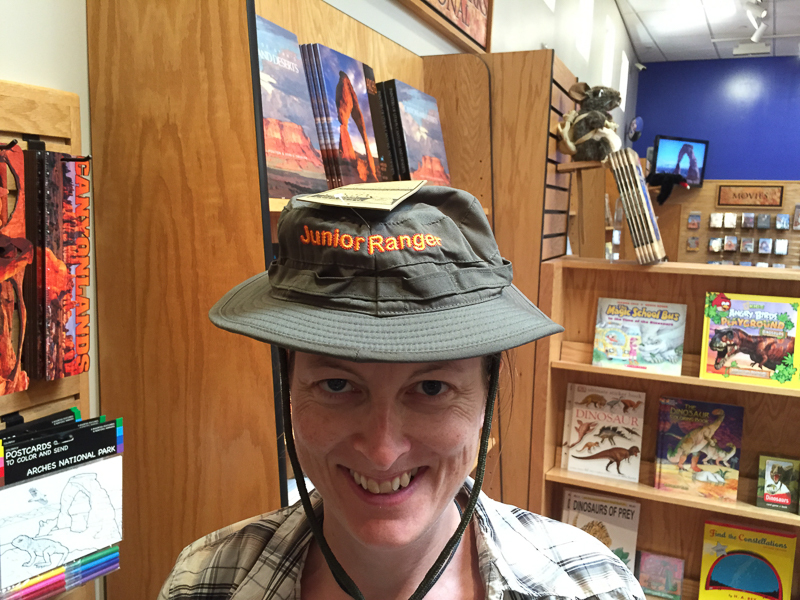 So following Julie’s research we headed in search of Bureau of Land Management sites next to the Colorado River. The BLM camps are first come first served and offer no facilities other than a long drop loo. The first two places were full. The next two were tents only. Another site on a river bend looked pretty full, but on checking the ticket on the pitch, the occupants had already checked out. Bingo. Three nights for less than the cost that grumpy guts wanted to charge for one night. Arches National Park is in the state of Utah, home to the mormons and has very strict rules when it comes to the consumption of alcohol. After a hard day’s driving we were busting for a glass of wine or two. We found a nice little bar but were informed we would have to eat something if we wanted a wine. Turns out beer chips were all that was needed, cheap and tasty. The supermarkets are not allowed to sell wine and the beer they sell is watered down to a lower alcohol strength. 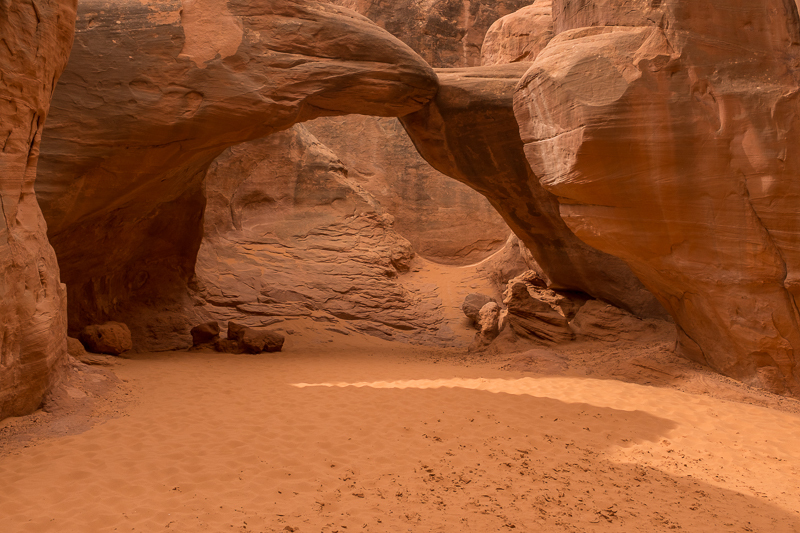 With over 2,000 sandstone arches, it’s a park full of incredible natural wonders. The wildlife is also a little different, rattlesnakes, kangaroo rats and spade foot toads are the ones to watch out for this time. First up was the hike to Devil’s Garden. This is a 15 kilometre trek with some amazing scenery. 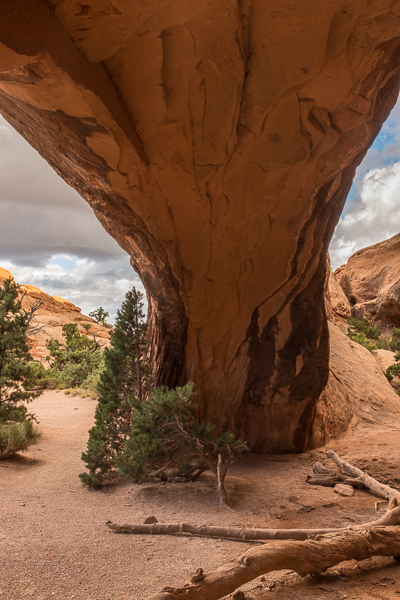 The first arch we came to and one of the most photogenic is Landscape Arch. This is the longest arch in the park and looks as if it could fall down at any moment. The hike itself takes you along a narrow fin of rock with steep drop offs. 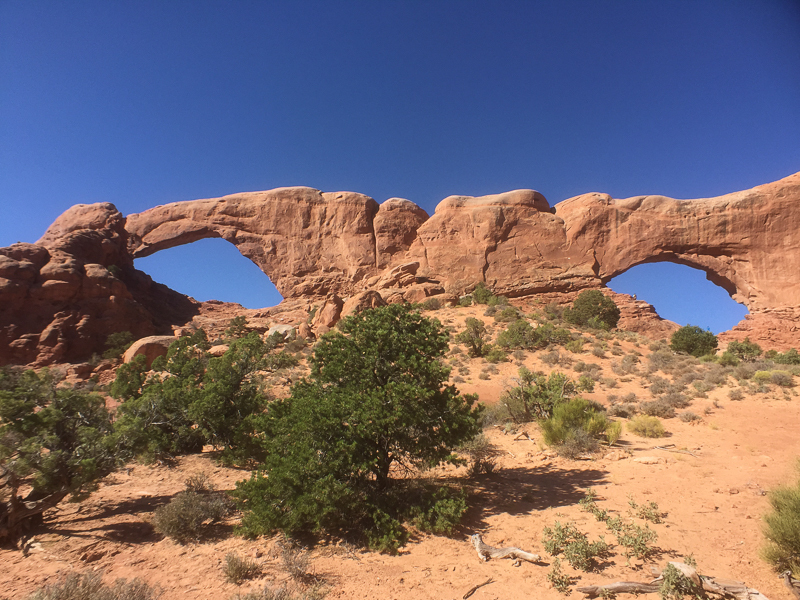 It’s the longest hike in the park and takes you passed some stunning arches. The views across this crazy landscape are amazing. It’s lunar meets Mars with a hint of playdoh. We had lunch at an area called Fiery Furnace. There is a hike you can take with a guide through the furnace, but this needed to be booked in advance and was sold out for the next few days. Later, we stopped to take in stunning rock formations such as Courthouse Towers, Sheep Rock and Three Gossips. These were at one end of Park Ave, a small valley surrounded by giant rock walls. Another early start saw us enter the park well before sunrise. I wanted to photograph Double Arch as the sun came up. Turns out we could have taken photos of nearly every other arch in the park, then had a cup of tea and still had time before the sun found its way across Double Arch. Never mind we passed the time talking to a couple that had heaps of travel stories to share. Having done sunrise we headed back to camp for some chill time before returning for sunset. But first a quick stop off at Balanced Rock. Returning to the park we took the 5 kilometre hike to the most photographed formation, Delicate Arch. The walk from the carpark was all uphill and at times across slick rock with a drop off. When we arrived it was almost standing room only. There must have been 200 hundred people with cameras of all shape and size just waiting for that killer shot as the sun dropped. Well almost everybody. There was a few folks including one father and his six kids all in tie dye t-shirts that kept insisting on being under the arch for their family snaps. The closer it got to sunset the less patient the hordes became, shouting and hollering abuse. This whole evening proved to be a great insight into human behaviour. Somebody who will remain nameless, muttered ‘jeez it’s only a rock’. So another two parks under our belt. Shame about the weather at Grand Teton, but the close encounter with the bear more than made up for it. Arches was truly magical in a very different way. We both came away stunned by the amazing architecture that Mother Nature can throw up.